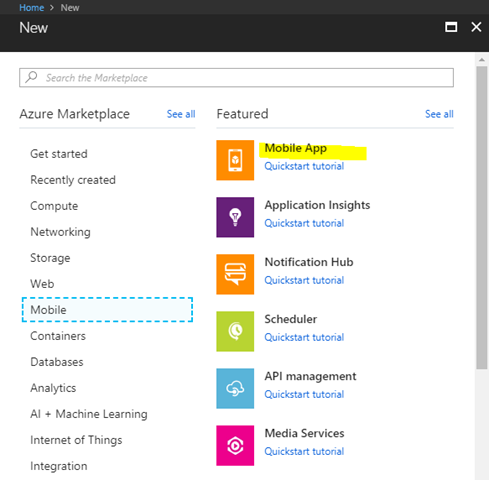 Mobile App Advantages – Microsoft Azure Articles.. In this post we can consider the Advantages of Mobile App Feature of App Service. The Offline Storage provides data storage during No-Internet times. For critical applications which require read/write response within 1 seconds can be achieved through Offline Storage of data helping read/write seamless. Azure Notification Hub support for Sending messages to multiple devices/platforms of Android, iOS, Windows etc. Facebook, Twitter Integration for Federated Authentication, Post Integration etc. Multiple devices can be supported through Auto Scale feature. Continuous Integration with Visual Studio & Github possible. We can create Mobile App Service from below link.